As Congress continues to craft the next farm bill, two critical conservation challenges need to be addressed. Pollution from farm runoff threatens the quality of drinking water for millions of Americans, largely in rural areas. The Environmental Quality Incentives Program, or EQIP, which is key to protecting drinking water, is turning away seven out of 10 farmers because of insufficient funding. But a newly introduced bipartisan bill could help with both problems. The EQIP Improvement Act, recently introduced by Sens. Cory Booker, D-N.J., and Mike Lee, R-Utah, would prioritize EQIP funding on the farming practices the government has identified as more effective at protecting water, soil and air quality, while reducing federal cost-sharing for practices that provide little or no environmental benefit. The bill would also reduce the overall payment cap on EQIP contracts, freeing up as much as 12 percent of existing funds to sign up more farmers for more contracts. A new EWG analysis shows that too little EQIP funding is going to the most effective conservation practices identified in the Booker-Lee bill, and too much is going to the least effective practices. 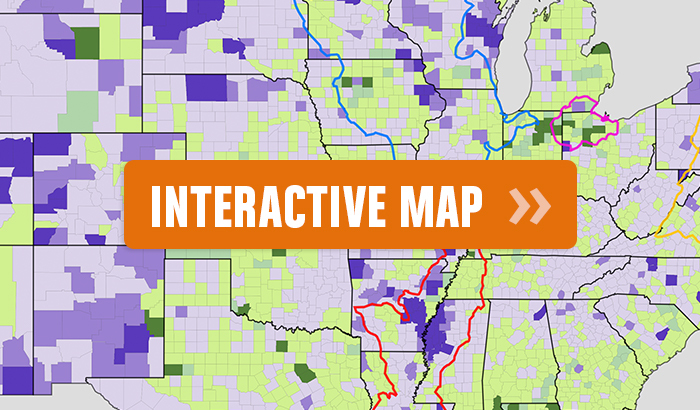 The interactive map below shows between 2012 and 2016, just 13.5 percent, or $546 million, of EQIP funding went toward the 11 most effective conservation practices identified in the bill. By contrast, more than 20 percent of funds, or $834 million, was spent on the 25 less effective practices. Most of the latter are common business expenses that most farmers pay themselves. In the Upper and Lower Mississippi River basins, impaired water quality from farm pollution is responsible for the ever-growing Dead Zone in the Gulf of Mexico and poor drinking water for thousands of communities. Yet, in those watersheds and many others, EQIP funding for high-priority practices between 2012 and 2016 often remained far below what was spent on less effective practices with little or no environmental benefits. In the Lower Mississippi River basin, $336 million was spent to sign up nearly 30,000 farmers for EQIP contracts between 2012 and 2016. Less than 10 percent of EQIP payments in the watershed went toward the most effective practices. By comparison, over 30 percent of EQIP funds in the watershed, totaling $111 million, went to pay for less effective practices, such as building access roads, laying irrigation pipeline or putting in ponds. It’s not all bad news. In some areas, like the Western Lake Erie Basin, which spans parts of Ohio, Indiana and Michigan, over 40 percent of EQIP funds spent between 2012 and 2016 went to contracts that included conservation practices like cover crops, nutrient management and no-till, which are the most effective at addressing water quality. But if we are going to improve water quality in critical watersheds, congressional leaders need to target conservation dollars to the most effective practices and free up resources to put more conservation dollars in the hands of more farmers.